Metallic gray with the gleam and scratches typical of brushed sheet metal. Mek Medium is a material with a bold contemporary appeal and its light tones create exclusive spaces, ideal for architectural and interior design projects where brightness is paramount. Mek Medium porcelain slabs sized 162x324 cm are available in a matte finish with a thickness of 12 cm. 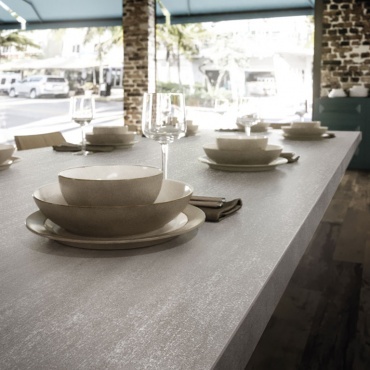 The metallic effect of the slabs is ideal for kitchen tables and worktops, but also for hotel and resort lobbies and counters in bars and restaurants striving for an uncluttered and modern look. Mek Medium Habitat: Mek Medium matt slabs by Atlas Plan are paired with Nash Dark Oak by Atlas Concorde. An industrial vibe coupled with natural elements, for a space in tune with the environment. Would you like more information on Atlas Plan products? You will be receiving an e-mail with a link to download the catalogue shortly. Unfortunately, a problem occurred and download was unsuccessful. Refresh the page and try again, and please contact us if the problem persists. Be the first to know about new products and stay up to date with the latest news on Atlas Plan. Unfortunately, an error has occurred. Please refresh the page or try again later.